It’s not difficult to get some free email templates surfing for a minute on the internet. Sometimes you will stumble on very good stuff, sometimes you won’t: plus, usually many layouts are just the same old story and the choice is pretty limited. Our approach is different. We believe in quality design: so we give you 10 free newsletter templates to make you try our professionals’ ability and propose you a whole package of 300 beautiful, original templates for a very reasonable price. All templates are collected and displayed in a lightweight software to download on your desktop: that will make browsing extremely easy, also because you will be able preview each template in full-size (so to check better its features). Full compatibility with all email clients. Our email templates are tested against all major clients and webmails – Mozilla Thunderbird, Microsoft Outlook, Gmail, Yahoo! Mail, Outlook.com, etc. Careful tests have been run also on mobile devices and different browsers: you’ll be sure that your newsletter will be displayed the same way everywhere. A handy software to browse all templates. No need to download an uncomfortable .ZIP file to unpack: you will be able to watch your templates directly in a “digital showcase”, then download the ones you need in every moment. Effective, but lightweight design. All templates are crafted with light images and graphics to maximize the deliverability of your newsletter and be downloaded more easily. 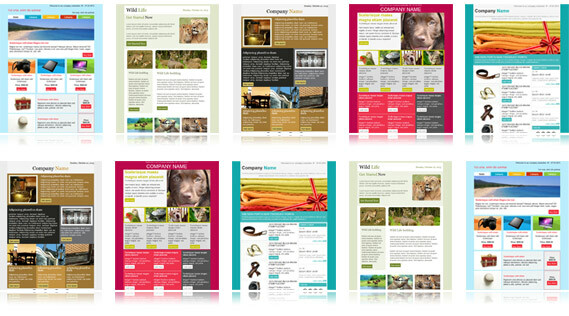 Customizable layouts with any mailing software. Once you have downloaded your preferred template you can put it in your favorite editor and add your content: our layouts work with all email programs and services: from basic clients like Thunderbird to professional tools like SendBlaster, GroupMail, MailChimp, Benchmark Email etc. Different categories, different styles. We think that any particular business or activity deserves a dedicated design. That is why we have differentiated our 300 templates according to various types of industry: so to make it easier for you to pick the layout that best fits your company. You can download the full software package (10 free templates immediately available) right now. Our HTML templates have been tested (and proved themselves to be perfectly compatible) with the most popular email clients. Change the layout, add new areas, or tweak the colors to better identify your brand. You can do that easily with your favorite mailing software. If you want to set up a proper email campaign, the first thing you should care about is to pick up the right newsletter template for your purposes.